Mammoth hot spring terraces. These hot spring photograph best under a cloudy sky or after the evening sun falls below the mountains to the west. Yellowstone National Park has been a photography destination ever since Henry Jackson took the first photos of Yellowstone in 1871, Yellowstone’s plethora of nature demands documentation from all who visit this world treasure. Yellowstone National Park welcomes photographers from across the country and from around the world to photograph its embarrassment of riches of natural wonders. Photographers come to document its pristine beauty and seasons of breathtaking contrasts: Scenic photographic opportunities abound, the wide-open grassy valleys, the perpendicular peaks of the Gallatin, Beartooth and Absaroka mountains. Yellowstone has hundreds of waterfalls, rivers that both gently meander through big valleys and writhing thorough whitewater canyons. This high mountain plateau attracts violent weather which makes wonderful accents too our earthly objects. More geysers than anywhere else on earth are here in Yellowstone waiting for the creative photographer capture eruptions of water at sunset. Colorful red and ocher mud pots, hot springs the deepest of blue outlined in orange and odd fumaroles dot the landscape of Yellowstone beaconing photographers from the other side of the world to take their story home. Yellowstone has also been referred to as America’s Serengeti because of the tens of thousands of elk, thousands of bison, mule deer, pronghorn antelope, the hundreds of wolves, bighorn sheep, and grizzly bears. This is why the Photo Safari has become so popular here. We have a plethora of our avian friends as well, birders are as happy in Yellowstone as are the megafauna aficionados because of the abundance of bald eagles, ospreys, mountain bluebirds and the chance of capturing a western tangier. The human element offers a role for the Yellowstone photographer as well. Human activity sometimes augments a beautiful natural scene. A horseman riding through a valley under towering mountains adds interest to a scene. 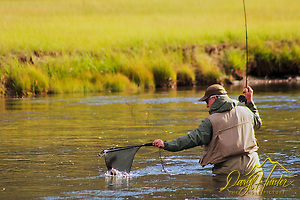 A fly-fisherman putting a river to good use is a beautiful subject. Hikers on a mountain trail drive home the fact. The mountains are also a place for people – people with cameras. An image of a canoe traveling across a mountain lake makes the viewer imagine they are there. Thousands of spectators gathering around Old Faithful tell a story of the wonders of Yellowstone and how they fascinate us all. There are three resources that should be seen by all Yellowstone photographers. 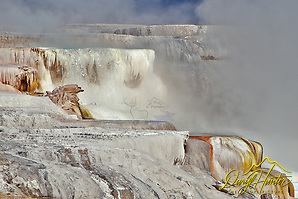 The first being the hydrothermal features, principally the geysers, and hot springs. Yellowstone hosts the greatest number of geysers anywhere on earth. Thermal features can be found throughout the park, yet the highest concentration of geysers and hot springs is in the Old Faithful area. The average photographer to this area can easily find these resources but without a guide may leave without understanding them or documenting them as well as is possible. The second must-see resource is the Grand Canyon of the Yellowstone River including its two waterfalls 109-foot Upper Yellowstone Falls and the 308-foot Lower Yellowstone Falls. The third resource of Yellowstone is its prodigious wildlife population, and this is precisely what brings most photographers to Yellowstone. 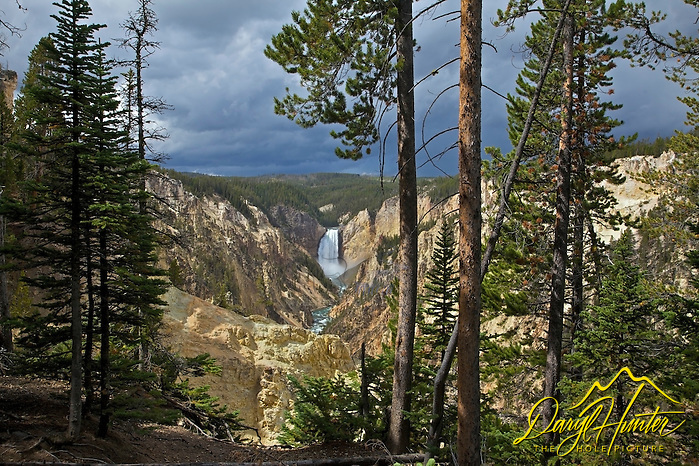 Photographers are increasingly demanding specific opportunities and qualities of their visits to Yellowstone and now many private photography tours can be customized to the wants and needs of the visiting photographer. Hiring a photography guide is not cheap, but a guide often know when landmarks are lit up the best and through their network of nature photography associates they have the best line on where the wolves and bears are most likely to be seen. Guides love sharing park history, ecology, natural history, and instructing nature photography. Private photo safaris and park tours allow the entire trip to be tailored to you and your group. These safaris provide maximum flexibility and personal attention. Explore America’s Serengeti and discover the Animals of Yellowstone National Park on a guided learning photo adventure. Wildlife photo safaris help the visiting photographer maximize their time in the park and see all kinds of wildlife in the Greater Yellowstone geo-ecosystem and providing fascinating educational experiences in a fun and relaxed environment. Posted on Wednesday, March 28th, 2012 at 9:20 pm. 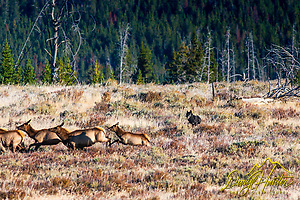 Filed under: Photograpy Tags: elk, grizzly bears, moose, Photographing Yellowstone, photography, wildlife photography, wolves	RSS 2.0 feed.